It’s funny because Eugene — look, he lacks survival skills. He lacks social skills with people. I think the last thing the writers are thinking is, ‘Let’s give him a love interest and watch him try to hold someone’s hand.’ That might steer us away from the gravity of what this show is. Well, this does make sense. While I would actually enjoy watching Eugene cozy up to some poor Alexandrian, it does seem like the stakes are so high in The Walking Dead that it wouldn’t necessarily fit the tone of the series. Josh McDermitt’s statement, which comes to us from The Wrap, really hammers in just how out of place Eugene is in the world of The Walking Dead. He’s essentially the opposite of our group of survivors. While everyone else, besides Father useless Gabriel, is extremely deadly while also being surprisingly well adjusted, Eugene stands out. 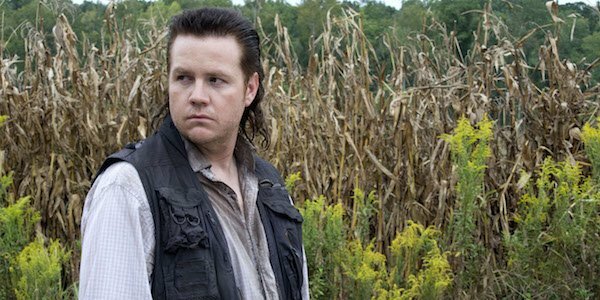 Eugene has survived essentially by Abraham, Rosita, and their now departed comrades completely taking care of him in their mission to get him to Washington. While it makes sense that he had a posse of protectors, it is still mind-boggling that he never got his feet wet and stabbed a few zombies in the brain. After all, it’s been a few years since the outbreak happened. Of course, the DC mission was scrapped after Eugene came clean regarding his big old lie. He didn’t work for the Human Genome Project. He was just a bright and well-read nerd. While I always find myself become extremely annoyed with survivors who couldn’t pull their weight in The Walking Dead, Eugene somehow has been the exception. When the show returns on Sunday, I don’t want anything to happen to Eugene. I love his comedic relief and relationships with Tara and Rosita. This is a stark contrast to how ready I am for Father Gabriel to bite the dust, or how long I loathed Carol and Beth before the show made them cool. I want to see Eugene develop his combat skills, and see if his relationship with Abraham ever repairs. Then again, with the impending threat of Negan and The Saviors, I probably shouldn’t hold my breath that both Abraham and Eugene survive the season long enough to kiss and make up. The Walking Dead returns to AMC tomorrow, February 14th. And it looks like it’s going to be a bloodbath. Do You Want Eugene To Find Love?